It's that time isn't it? Time to dive into My January Favorites for 2014. So I mentioned this in my 2013 Favorites here, (check it out for more specifics) but I had to mention it again because I at the time I only had a sample, but have since purchased the actual bottle. As this is not the cheapest of products I used up my whole sample before buying, making sure it was true love not just the "new product crush" I'm sure we have all succumb to. The little sample size lasted a whole two months and I fell in love, for real. I saw scars from blemishes fading, I saw redness in my cheeks going down and I saw an overall improvement in the tone, texture and feel of my skin. This oil comes in a 1.7 fl oz. purple glass bottle with a little dropper attached to the lid. $46. at TarteCosmetics.com It comes in great packaging and feels so soothing and lovely on the face and neck. *cough* Anti-aging *cough*. Here is a picture of the amazonian maracuja fruit (sustainably harvested) that the oil comes from, rich in vitamin C and fatty acids. Just yes! that's all I can say about this. I got my Nars on this month, this being one of two purchases that I have been obsessed with. ...Nars Pure Radiant Tinted Moisturizer in Terre Neuve $42. at NarsCosmetics.com. "Infused with lush, naturally derived botanicals and ingredients to immediately help thirsty skin feel hydrated. Kopara from French Polynesia and mineral rich seawater revive and re-mineralize skin for a softer, smoother, and brighter natural glow. Well that is a tall order...but I think it just may do it. Now I'm not saying that you'll get all new skin that feels and looks like it did when you were a baby, but what I will say is I haven't been this happy with a tinted moisturizer...well ever. I found the best results were when applied with my hands. When I wasn't smoothing Copacabana from Nars on my skin I was dabbing Watt's Up! from Benefit on the tops of my cheekbones. I had kind of forgotten about this little guy towards the end of the year. I got this in my birthday gift from Sephora last year. (I'll be getting another one of those soon!) I used it for about six months straight and barely made a dent in the sample size. This pearly gold cream highlight gives skin a gorgeous glow that reminds me of that of today's Hollywood-perfected vampire skin. Cheekbones that could cut diamonds can be achieved when paired with a good contour. When this sample runs out I won't flinch to buy the full sized, priced at $30. at BenefitCosmetics.com. But if you're not sold yet they offer a deluxe sample size for $8.00 here. Hello handsome! I have been suffering from a dry, itchy scalp out of nowhere the past two months and I said to myself "What are doing? Get some Lush hair care, girl." I picked up a sample of the Roots hair treatment and got the whole pot the next day. Relief and a minty tingle. This glorious stuff invented by Mark Constantine (Lush founder) when he wanted to get back to his "Roots" of being a Tricholigist. This stimulating,(fresh mint, peppermint oil and spearmint oil) hydrating (extra virgin olive oil and honey) and hair growth inducing gem did the trick. My scalp hasn't felt this good in a long time. It is fairly priced at $19.95 at LushUSA.com and in store. If you aren't in the US go here to find your pricing. All I can say is "Essie-Button made me do it!" After she went on about this liner in her Sephora Beauty Haul I was suddenly quite pleased I had run out of my usual black liner as it gave me an excuse to run to Sephora. Can I just say she was right! This stuff is amazing! Blaaaack and the little tip is nicely pointed. I had always been scared to try this as it was in pen form and how would that work? Well, just fine, was my answer. This stuff, as mentioned by Estée, does not move until you want it to. A massive thumbs up! $20. at StilaCosmetics.com. Also can I make Estee a monthly favorite? Because she really is. I laugh with her as I watch her videos and relate to her homebody-ness, but also I trust her opinion and product taste. Her blog is sublime and a delight to read. So dang-it, I'm doin' it! Estée from Essie-Button is my January Favorite: Beauty Blogger. She is one of the bloggers who inspired me to jump in and just start blogging even if it scared me a bit. She is truly herself and I adore that quality to be absolutely, unabashedly one's self. Here are some color swatches. From left to right. Benefit Watt's Up, Nars Pure Radiant Tinted Moisturizer in Terre Neuve and Nars Illuminator in Copacabana. This candle is delicious. Now normally I hate super sweet smells but this smells like walking past a Cinnabon in the mall. I got this at Bath and Body Works at Christmas time and it is fab! Lastly my A Few of My Favorite Things Palette was my most used palette. Unfortunately this is a limited edition product from Too Faced, though the bronzers are not LE. This palette speaks as to how wonderful Too Faced is. The blushes are perfection on the skin. Chocolate Soleil not only smells of chocolate but is a great contour shade (not orange at all). I have been getting so many people asking me about my eye makeup when I use this palette. The shadows are so buttery and soft. Even though you can't get this anymore I suggest you give some other Too Faced products a whirl. 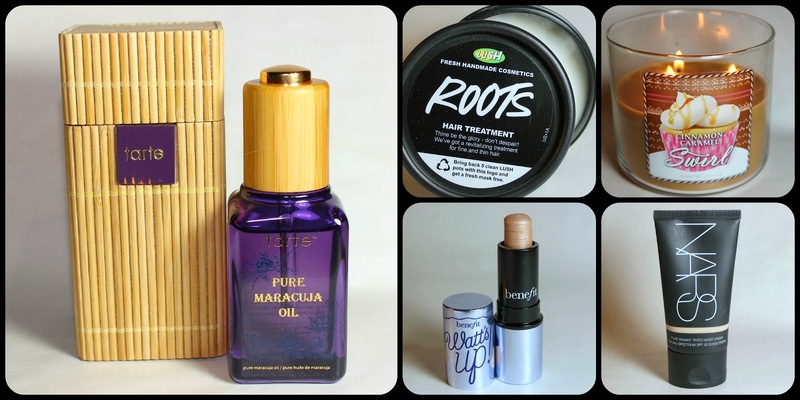 So those have been the products and (blogger) that I am obsessed with this month. What have you been loving? I hope this has been a fun read and maybe helped you in your beauty quest. Please like, share and subscribe if you enjoyed this read. You can follow my Twitter and Instagram if you'd fancy some more Lipstick is a Life in yours.